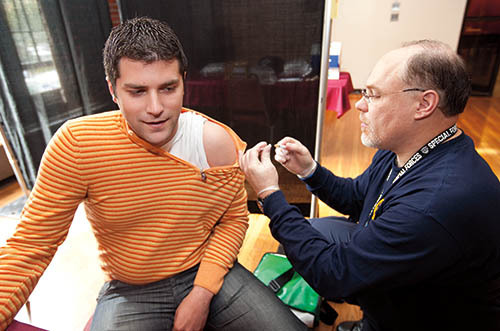 During a Chase Lounge clinic, Miljan Zecevic ’10 of Pljevlja, Montenegro, receives an H1N1 vaccine injection. As the number of students with H1N1 flu topped 250 in October, Bates implemented its H1N1 protocols: education about prevention strategies; isolation of ill students; and vaccinations, with the Maine Center for Disease Control giving more than 1,000 injectable and nasal-spray vaccines to Bates specifically due to the large number of campus cases. Administering this flu shot is Steve Doczy-Bordi of the Northern New England Metropolitan Medical Response System. Photograph by Phyllis Graber Jensen.